Are You One Of The 170 Million Americans Drinking Radioactive Tap Water? According to a new bombshell report from the Environmental Working Group (EWG), tap water for more than 170 million Americans contains radioactive elements that may increase the risk of cancer. 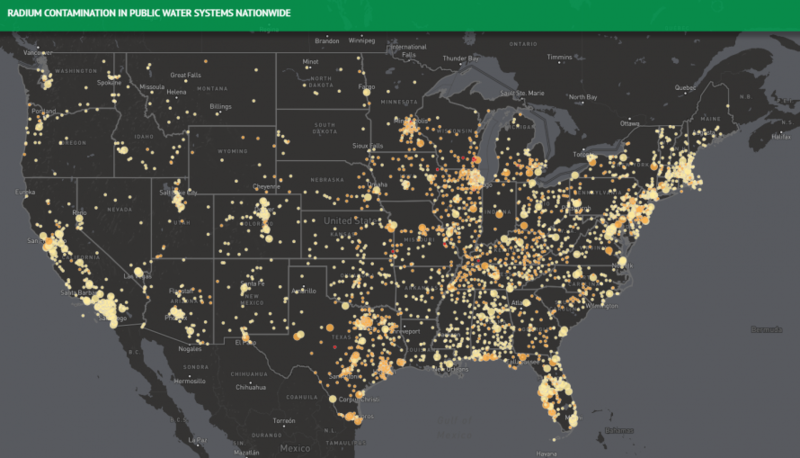 The group examined 50,000 public water systems throughout the United States and found from 2010 to 2015, more than 22,000 water utilities reported radium in treated water. Radiation in tap water poses serious health threats, particularly for children, and women during pregnancy. The most common radioactive element the EWG found was radium. Studies show that radium above the EPA legal limit may cause depression of the immune system, anemia, cataracts, fractured teeth, and of course cancer. Radium is a naturally occurring radioactive element that resides on the earth’s crust. The EWG emphasizes that higher radium levels in tap water occur when uranium mining or oil and gas drilling exploration companies disturb the earth’s geology. The process triggers radiation called “ionizing because it can release electrons from atoms and molecules, and turn them into ions,” explained the EWG. The EPA warns that all ionizing radiation is carcinogenic, implying that radium above the EPA limit is all too prevalent in America and it could be causing lots of cancer. In 158 public water systems serving some 276,000 Americans in 27 states, the EWG found that radium exceeded the federal legal ceiling for radium-226 and radium-228. The EWG’s Tap Water Database covers six radioactive contaminants, including radium, radon, and uranium. The database shows radium-226 and radium-228 are the two most common forms of radiation in every state. The EWG expresses frustration with the 41-year old federal drinking water standards that are not designed to protect human health. New public health goals were set in 2006 by the California Office of Environmental Hazard Assessment, but have been widely overlooked by the federal government. Federal drinking water standards are based on the cost and feasibility of removing contaminants, not scientific determinations of what is necessary to fully protect human health. And like many EPA tap water standards, the radium limits are based on decades-old research rather than the latest science. The EPA’s tap water limits on the combined level of the radium isotopes and the combined level of alpha and beta particles were set in 1976. They were retained in 2000, when the uranium standard was established. To more accurately assess the current threat of radiation in U.S. tap water, we compared levels of the contaminants detected by local utilities not to the EPA’s 41-year-old legal limits, but to the public health goals set in 2006 by the respected and influential California Office of Environmental Hazard Assessment. California public health goals are not legally enforceable limits, but guidelines for levels of contaminants that pose only a minimal risk – usually defined as no more than one expected case of cancer in every million people who drink the water for a lifetime. California standards are hundreds of times more stringent than the current EPA limits for radium-226 and radium-228. If the federal government adopted the new tests, it would mean that no more than one case of cancer per million people per water supply. That would likely cause a public health emergency across the United States, but apparently, that is something the government has no intentions in doing in the intermediate time. So, for now, Americans will enjoy a higher risk of cancer one glass of water at a time, because, perhaps, cancer is very profitable for pharmaceutical companies, or the country is just flat broke and cannot afford new infrastructure. “Most radioactive elements in tap water come from natural sources, but that doesn’t take away the need to protect people through stronger standards and better water treatment,” Olga Naidenko, senior science adviser at EWG, said in a statement. Radium concentrations in drinking water are drawn from EWG’s Tap Water database, and represent the average of all samples of treated drinking water collected from 2010 to 2015 for each water system. Samples reported as non-detections are entered as zero, which could underestimate the actual radium concentration in drinking water. Federal drinking water regulations set a Maximum Contaminant Level, an enforceable legal standard, of 5 picocuries per liter (pCi/L) for the combined level of two isotopes of radium: radium-226 and radium-228. Some water utilities and states report individual levels of these isotopes, while others report a single combined radium value of a specific sample. When the combined level was not reported by the water utility, EWG added measurements of radium-226 and radium–228 to calculate it, as available. This map displays radium data for 1,850 community water systems serving more than 10,000 customers, and 1,620 community water systems serving between 3,301 and 10,000 customers. The water system locations were mapped based on the Environmental Protection Agency’s Safe Drinking Water Information System, or SDWIS. Locations are approximate and are meant to visualize the general area served by a specific water system – not to give the specific address of the water treatment plant. The map does not include water systems that did not detect radium between 2010 and 2015. It also does not include those water systems for which EWG could not confirm geographic locations. Click here for interactive version. On the map, dots indicating water system locations are color-coded according to the combined radium levels. Dot size reflects the water system’s size of above or below 100,000 customers. Any changes in water sources and treatment, and water quality after 2015, are not reflected in EWG’s analysis. For more detail on data reporting methods for EWG’s Tap Water Database, read our Methodology.